Chongqing Zongshen Automobile Industry Co., Ltd. (hereinafter referred to as "Zongshen Motorcycle") is one of the core subsidiaries of Zongshen Industrial Group. As a large-scale comprehensive enterprise, it mainly manufactures and sells motorcycles, E-bikes, motorcycle spare parts, automobile spare parts and IT spare parts etc... It includes two-wheeler division, electric bike division, injection division, welding plant, painting plant, South China motorcycle division and R&D center. The company has assets of over RMB 1.18 billion, more than 3,000 employees, and has the annual output of 4 million motorcycles, E-bikes and three wheelers and more than 7 million pieces of key & important components. Zongshen Motorcycle adheres to the group’s strategic vision of "global influence, everlasting vitality" and the principle of "excellent manufacturing, international cooperation and leading technology". It mainly manufactures series of generalized products targeted at motorcycles and has established a complete set of technical research and development system, production & manufacturing system and quality assurance system. Zongshen Motorcycle owns two famous brands, “Zongshen” brand and “Zipstar” brand, whose products are independently developed by Zongshen and have independent intellectual properties. The two-wheeled motorcycles, E-bikes and three wheelers produced by Zongshen have 9 series, as well as more than 200 kinds, including tour series, road series, street series, scooter series, chopper series, functional series, sport series, cub series and dirt bike series, and the quality and technology remain in a leading position in China. Zongshen Motorcycle’s manufacturing system uses the international advanced flexible assembly lines and has the logistic support from "intelligent production" and "JIT production" which has the unique group-based assembly function and can achieve on-line detection of 100% of the key & important components. Zongshen Motorcycle has established more than 10,000 sales outlets in 31 provinces, municipalities and autonomous regions in China, which makes the sales of Zongshen’s motorcycle in China among the best candidates of this industry since 2001. Meanwhile, it has established sales company or offices in the USA, the Philippines, Pakistan, and Colombia etc. Zongshen Motorcycle’s international sales network covers more than 80 countries and regions in the world and it has registered "Zongshen" trademark or "Zip star" trademark in more than 160 countries. The annual export amount reaches USD 200 million averagely. Zongshen Motorcycle is among the first enterprises that have obtained "China Compulsory Certification (3C) for Complete Vehicles" in the industry as well as one of the enterprises that have obtained the most certifications on individual products in the Chinese motorcycle industry. Zongshen Motorcycle takes the first to combine ISO9001 (Quality Management System), ISO14001 (Environmental Management System) and OHSAS18001 (Occupational Health and Safety Management System) together to form an integrated management system and has passed the certification. In June 2003, Zongshen Motorcycle passed the national COP production access examination and was one of the first four motorcycle manufacturers that passed the COP examination. On May 8th 2011, Zongshen Motorcycle became the first company passing the electric-motorcycle production access examination conducted by the Ministry of Industry and Information Technology of China and obtained the first electric-motorcycle product announcement. Its products passed the national exemption examination and its IT spare parts passed UL certificate in 2013, supplying for many famous IT enterprises. 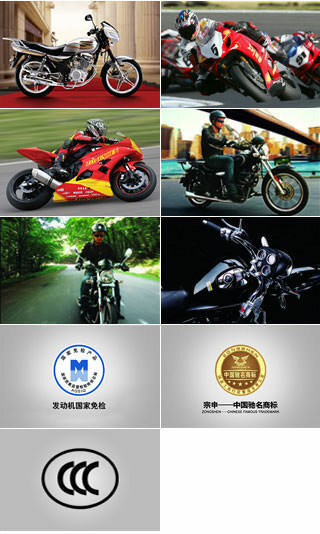 Trademark of "Zongshen" motorcycles have been awarded the honor of "Famous trademark in China" and one of the ten famous motorcycle brands in China, and the company has been successively named "Chongqing High-Tech Enterprise" and "National Model Enterprise for Excellent Technical Innovation". In 2012, Zongshen Motorcycle obtained the certificate of “National Safety Production Standardization Secondary Machine “. Zongshen Motorcycle Racing Team, founded in 1999, is the first motorcycle racing team of China that participated in the MotoGP World Championship and has won numerous honors in the field of gasoline motorcycle sports. Since 2010, Zongshen Industrial Group has been strongly supportive for the racing team to enter into the new energy sports field and participate in the TTXGP—the top-level competition in electric-motorcycle racing field –in which Zongshen Motorcycle Racing Team has won the championship in Germany in 2012, setting an example with its action for promoting energy saving and emission reduction, environmental protection, healthy life and the establishment of a conservation-minded society.